Straight from Cologne, we proudly debut with our first release on Technology Gap 001, with some deep as its gets straight up House Music acompaning your personal summer madness. 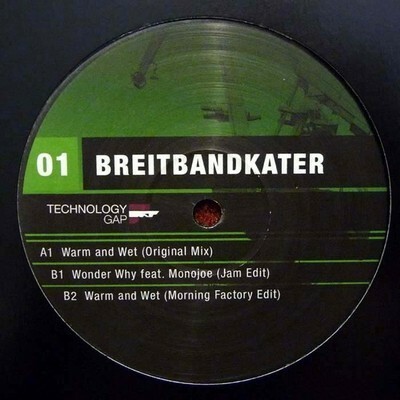 Anyone wondering what Oliver Kochʼs Breitbankater projectʼs all about need only turn to the Epʼs opening cut, “warm and Wet,” wherein the Cologne-based producer proclaims, “i want the best for you / So everything I do / is house music.” Yep, Technology Gap 001 is house music all right, and a particularly fine sampling of it too. The aforementioned “warm and Wet” immediately declares itself an Ep high point the moment it’s thumping bass pulse kicks in. Sleekly designed, the cut begins with a tight minimal swing that swells into a jacking house fireball while serving up six minutes of chunky chords and cracking snares. The second track, “wonder Why,” tips the balance in a slightly more soulful deep house direction when Monojoe spreads an exuberant vocal over Breitbandkaters lush backing. Warm chords and a sweetly grooving pulse provide a soft cushion for some old-school cymbal patterns and a radiant synth hook in the smooth stormer. Adopting a slightly more atmospheric approach, with House Group of the Hour, Morning Factory winds up the Ep with a trippy remix of “warm and Wet” which finds Kochʼs vocal drifting through the slow-building mix in a semi-entranced daze. Lovers of classy deep house should no doubt find much to admire about Breitbankaterʼs three-tracker. Go hunt, its good for you!